There are believers, and there are cynics. The cynic looks at the glass as half empty. The believer just sees the room for improvement. The cynic looks at the tides of recession and mourns its ebb. The believer unearths a million new opportunities in the sands. The cynic reads this and sees a association. The believer reads this and sees a life-changing opportunity. No matter what you believe in, we'd first like to know if you believe in yourself. Believers, welcome to AIGETOA..
A much awaited moment has arrived and jubilant atmosphere is prevailing in the minds of each & every DR. In response to the outcome of meeting with management our ongoing agitation is called off and proposed hunger strike from 12.8.13 is withdrawn. 1. The issue of standard pay scales implementation will be resolved within 2 months. 2. 30% super annuation will be resolved within 2 months by taking inputs from AIGETOA. 3. MT/DGM external recruitment issue will be resolved expeditiously within 2 months. 4. Mass displacement in LDCE issue will be settled in consultation with Association & CGMs. 5.EPF anomalies will be resolved expeditiously by the EPF cell. 6. Uniformity in 1st TBP will be considered. Friends, At this moment we sincerely thank the people who brought us this victory. Our CHQ leaders Sri. R P Shahu, Sri Abhishek Chowdari, Circle leaders CS-Sri.Veerabhadra Rao, Sri.G.Satish, CWC members Sri Laxman,Sri M R Narender,Sri.Venu Gopal, HTD leaders Sri.Ramanjaneyulu, Sri.Madhava Rao, ITPC leaders Sri. Mani Babu, Sri. Venkataiah etc and thousands of other members who gathered at New Delhi in support of this noble cause. It is reliably learnt that the management is negotiating with our CHQ leaders and we are sure that is impasse would conclude in a positive manner as things are moving towards a resolution. Meanwhile all members are once again requested to maintain the status-quo status and not join offices until the agitation is called off. The next plan of action is Indefinite Hunger Strike from monday. The sacrifices of the leaders will go in vain if we dilute the agitation program by performing office work. It is assured from CHQ that this period will be negotiated to be considered as leave hence no loss of service will be effected. Just have faith in our leadership and do not believe in rumours created by some rouge elements. Around 15 members from Hyderabad including ITPC are moving to Delhi on 4.8.2013 along with around 40 more all over AP to join enmass members at Jantar Mantar. We wish all the best and we salute to their courage. At Hyderabad: The members of HTD, C1, ITPC gathered at CTO Bldg, Secunderabad for gate demonstration under the president-ship of Sri. Venkataiah ITPC. Sri. 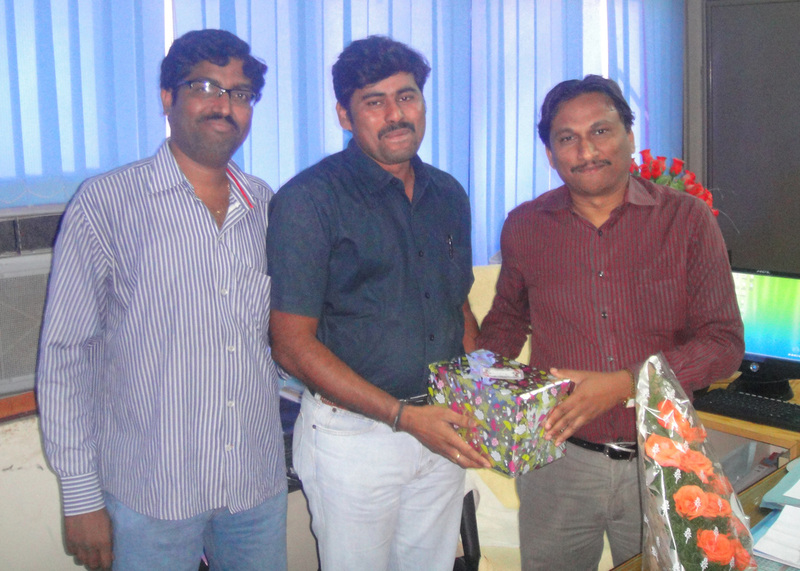 Ramu CFS-AP, Sri.Krishna Kishore ACS-C1, Sri. D.V.Ramanjaneyulu DS HYD, Sri. Krishna Mohan ADS C1, Sri. Ramu AFS C1 and around 40 members were present. Sri. Venkataiah appraised the members regarding latest developments at Delhi. He informed that around 2000 executives gathered at Jantar Mantar, New Delhi since 29th July and 1500 more are expected by next Monday. Agitation is in full swing with pressure mounting on Management from all quarters. We are not going to move from Delhi until our issues are resolved. The agitation is at peak level and we are going to get success at any cost. He conveyed his worry regarding some people are still attending offices. He appealed our friends who are still attending offices that this is their last chance to be a part of the main stream else they will be left out. Sri D.V.Ramanjaneyulu appealed to all the members who reported at HTD Admn for SDE posting that they should apply leave untill CHQ calls of the agitation by submitting EL/MC to AGM(Admn) immediately as the agitation reached to a peak level. It is Now or never condition. He also appealed to the members who are already on leave should extend it for next week also. At Delhi:Agitation is going on full swing at Jantar Mantar on Day 6 of 3rd week. We are sure of achieving the results. This is the "revolutionary struggle" in the history of BSNL to secure our "Right and Respect". Our ongoing struggle has now taken wider shape and we are very much confident that we will be able to achieve all our rights with your active support. About 90% direct recruits executives of BSNL have been part of this revolutionary struggle now it is high time for hardly 10% direct recruits executives who are yet not the part of this struggle so far. We appeals such direct recruits who have not shown faith on this association and still working in the offices to join their hands with your own fraternity for your own cause. Your active participation is highly required at this crucial stage of our struggle for achieving our goal early. Remember such revolutionary struggle takes place once in decades hence don’t put yourself in embarrassing situation by keeping your self away from your fraternity who are fighting for your own cause. Don’t worry about any action like salary cut, memo, chargesheet or any other action by some vicious officers which is only virtual. What the maximum can happen ? They can cut your salary, they can stop your promotion, they can stop your family future security but certainly they cannot cut your hands, they cannot hang your family, they cannot abduct your knowledge and experience. Whatever they can stop is already not available in BSNL for direct recruits and this association is fighting for these issues only. Belligerents should not see the crept people who are yet working in their offices & are very less in numbers, they should see the people who have been sitting at Jantar-Mantar since last seven days and are committed to sit till the resolution of the issues. This is the struggle which will give you the actual benefits of being "Employees of Government Company". This is the struggle which will save your "Pay, Career, Future and Social Security of you and your family". This association also appeals to all other direct recruits from non-executives to direct recruits DGMs to join your hands in this ongoing struggle and reach Delhi by coming monday as all these issues are equally affecting you. Your participation in this struggle will definitely motivate us and help in resolving these basic issues. It is reliably learnt that out of 5 cirlces where mass displacement took place, one of the CGM has sent their DGM who was assured by the management that this displacements will be reduced and a new order will be given within 4 to 5 days and all the displaced members are requested to be present in Delhi and participate in the agitation to make it a reality. On seeing the photographs and videos of agitation at Jantar Mantar, one can witness how our brave soldiers are fighting with great spirit, courage and Zeal against the "Ziddi" management and climate of hot temperature and humidity. We are witnessing the movement to a level which has never been witnessed in the history of BSNL. " Naa Bootho Naa Bhavisyath". We salute all these great soldiers. At this movement, the sayings of a great poet is reproduced here "
It is humble appeal to all Direct Recruits JTO/JAO/SDE/AO even to the newly recruited DGMs and TTAs that those who have not reached Delhi yet must immediately proceed for Delhi and be the part of this historical event. We are committed to fight till we achieve and for that if needed, we are committed to shed the last drop of blood in our bodies and fight till our last breath. We are committed to perform and perform till we force management to give our rightful dues. At Hyderabad: A gate demonstration was held at Data Centre, OU campus at 1100 Hrs under the presidentship of Sri. Venkataiah, Dist President ITPC HYD. More than 80 members from all over areas like HTD, C1, Circle Office, ITPC, STP & STR gathered at the meeting. Sri. Venkataiah appraised the members regarding latest developments at Delhi. He informed that around 2000 executives gathered at Jantar Mantar, New Delhi since 29th July and 1500 more are expected by next Monday. Agitation is in full swing with pressure mounting on Management from all quarters. We are not going to move from Delhi until our issues are resolved. He appealed our friends who are still attending offices that this their last chance to be a part of the main stream else they will be left out. Sri.B.Laxman CWC Member addressed the Direct Recruits of A.P Circle in Telugu at the Agitation Camp in Jantar Mantar, where he appealed that those members who are still working in their offices inspite of many requests are not only deceiving themselves but also their family members. They may kindly have the heart to join the agitation, atleat after seeing that those members who have joined the Agitation at NEw Delhi are not just fighting for themselves but also for the right of those who are working in their offices paying no heed to the calls of the CHQ. He requested with folded hands that those who have not yet joined the agitation for their petty excuses and needs, should introspect themselves and join the agitation at the earliest as this is the only way we can make the Management to heed to the Demands of Direct Recruits. ThIS historic Agitation call given by AIGETOA-CHQ is at its peak and CHQ is very confident of achieving our righteous wants and demands very soon. CMD who is currently out of station is expected to be back to New Delhi on Thursday morning and CHQ may be called for meeting with the Management. we request to all the members to make themselves present in New Delhi en Masse at least before Monday and make a difference, as the day of achieving our justified rights is very near. All are requested to refrain from joining their duties even if required for the next week and continue to be on leave till our rights are obtained and demands are acceded by the BSNL Management. We appeal to all the mass displaced LDCE candidates not to believe in any rumors floating, but to listen to what CS or CP says. Kindly follow the CHQ call. A group of brave hearts lead by Sri. G.Satish CVP-AP along with Sri. Samuel C1 TBN, Sri. Ravi CM BSNL Bhavan started to Delhi in AP express join Satyawardhan Rao JS(South) and Rajasekhar ACS(Telengana) with 4 more members from Karimnagar. On-behalf of all the DRs in Hyderabad, we salute these brave hearts for sacrificing their personnel comfort, time and money who are going to join thousands of DRs in Delhi to fight for DR community and wish them all the best. At Delhi:On Day-2 of Mass Demonstration at Jantar-Mantar, New Delhi Shri Jagdambika Pal, Member of Parliament & Chairman, Committee on Public Undertaking addressed the Direct recruits at Jantar-Mantar. At Hyderabad: A team of 15 members gathered at Circle Office AP and spoke to those who are joining to office and motivated them to keep themselves away from the office. We sincerely appealed to them to extend their leave. This team addressed a gathering of 50 members. At Delhi: 20 brave soldiers from HYD joined 100s of soldiers from AP and 1000s soldiers from India at New Delhi. GS along with AIP had a meeting with DR HR at 1100 Hrs which longed for nearly 4 Hrs. Though the outcome of today's talks is not a firm positive, but it is encouraging. Management will heed to our RIGHTS. Its just a matter of time. Director (HR) while appreciated the issues and shown his concern but could not extend firm commitment towards resolution of the issues. He agreed to look into all the issues raised by this association with positive approach but in the absence of CMD BSNL who is right now out of country, he could not give any commitment which can be treated as concrete. As all the issues raised by this association are our very basic right and genuine need for survival in the government company are pending since long time. This association appeals all the direct recruits fraternity to please extend your support and don't let this cadre to die down. This event will be written in golden ink for up-liftment of the direct recruitment fraternity in BSNL just extend your few days contribution to your own cause and make arrange to reach Delhi as much as possible, if not made so far. if at all not possible to reach New Delhi please do not attend the office till we reach to resolution of the issues. At Hyderabad: A team of 15 members gathered at TBN and spoke to those who are joining to office and motivated them to keep themselves away from the office. We sincerely appealed to them to extend their leave. This team also visited BSNL Bhavan and addressed a gathering of 50 members. The same team will visit each and every office in next days. participation in this historic struggle. Delhi demonstration and feel proud of being part of this fight for right and respect. are fighting for you on roads. 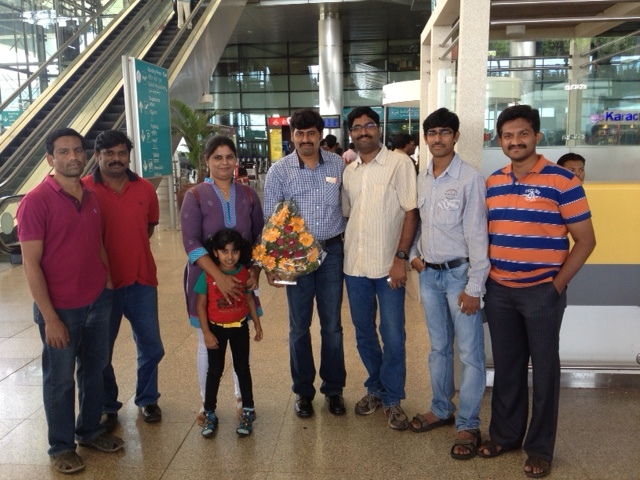 First group of warriors from HYD lead by Sri. P.Madhavarao, Dist. President HYD with 20 members started to New Delhi in AP express on 28.07.2013. Sri. Ramakrishna DVP North, Sri. Ramesh Finance Sec., Sri. Srinivasa Chaitanya ADS West, Sri. Adinarayana BS west, Sri. Vittal BS North are from HYD executive body along with members Sri. M.Raju C1 TBN, Vasu TBN, Sri. Rajaram North, Sri. Rajender GWD, Sri. Bardwaj GWD and circle body members Sri. VeeraBhadra Rao CS-AP, Sri. Laxman CWC, Sri. M.R.Narender Kumar CWC, T.Shanker CWC, Sri. Venugopal CWC, Sri. Mega Shyam WS-AP, Sri. Narender Kumar OS-AP. On-behalf of all the DRs in Hyderabad, we salute these brave hearts for sacrificing their personnel comfort, time and money who are going to join thousands of DRs in Delhi to fight for DR community and wish them all the best and we assure 100% participation in this historic fight by not going to offices. 27.07.2013: Well done is better than well said. It is ironic that on one side management is acknowledging our contributions & agreeing that our demands are genuine, it is non-committal about resolving atleast one single issue out of seven issues projected. We completely fail to understand as how the demands from so called legacy are immediately granted without worrying about the "current situations", while it always has been coming in our way since last 4 years. Remember A promise is a cloud; fulfilment is rain. As expected from poor HR management, the negotiations for settlement of the unrest have failed. We are left with no option but to tell the management in a language they understand better, hooliganism. 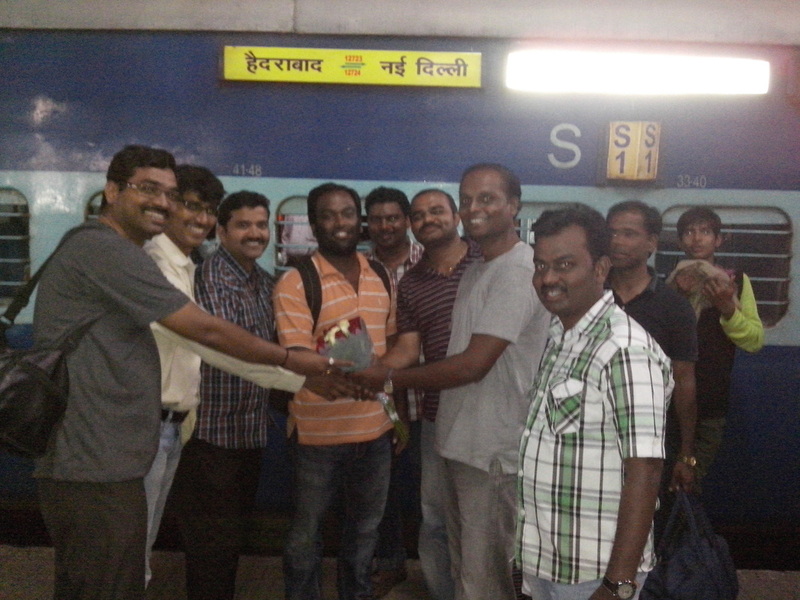 The first batch is starting to Delhi on 28.07.2013. Members who are interested to join us after a day or two may give their names to DFS Sri.Ramesh (9440446858). CHQ Update: GS Sri Shahu met Secretary DOT & Addl Secretary DOT and elaborated in detail the stalemate going on currently. Upon directions from DOT BSNL management woke up from deep sleep and the dialogue process is expected to start from tomorrow. Circle Update: CS Sri Veerabhadra Rao along with Sri. Satish, Sri. Laxman, Sri. Ramu, Sri.Megha Shyam & Sri Shankar met Hon'ble Chief Minister of AP Sri. N.Kiran Kumar Reddy and appraised him about the current situation in BSNL AP Circle and requested him to intervene in the mass transfers of LDCE Passed candidates to CTD and WB. Hon'ble CM assured that he will speak to Sri Kapil Sibal and MOS-Telecom Dr.Kruparani for resolving the issue. HTD Update: Sri. Amit Roy, AGS AIGETOA, addressed around 200 Direct Recruits at Telephone Bhavan, Hyderabad. In his scintillating speech, Sri.Roy appraised all the members about the current issues pertaining to the Direct Recruits and gave a call to all the members to participate in the Agitation with total dedication. He informed that if 70 members strength was sufficient to remove a faltering Sr.GM, with this level of mass gathering we can achieve any thing & everything. He appealed to each & every member not to perform office work until our agitation is called off & any deviation in this matter will dilute the entire process. He informed that our GS & other CHQ office bearers are ready to face any consequences & they only need the confidence of all the members in its leadership. He requested that all the members should come to New Delhi in mass and display our solidarity and strength. We are thankful to all the members who have showed up in a very short duration and have made this event a grand success. Later DP Sri.Madhava Rao & DS Sri. Ramanjaneyulu addressed the gathering and sought the names of the volunteers who are willing to come to New Delhi. It was informed to come prepared to stay at Delhi for atleast 1 week and plan for baggage & finance (Rs.1000/day/person) accordingly. Interested members are requested to register their names with DFS Sri.Ramesh (9440446858) before 26.7.13 evening as train reservations needs to be planned. LDCE UPDATE: AP circle office issued SSA posting orders to the 88 LDCE qualified executives. KNOW YOUR AGITATION PROGRAM, WHAT ARE WE FIGHTING FOR? More than 50% of DRs are not clear about the impact of the loss we are incurring. We make an attempt to clarify the same. In case of any doubts pl feel free to contact us. 1. 30% superannuation benefit : As per DPE guidelines we are entitled for 30% retirement benefits but our present benefits are curtailed by management to 18%. We are fighting for balance 12% contribution from BSNL. 2. Implementation of standard pay scales: Management is dilly-dallying and deliberately delaying the implementation of E2 scale for JTO & E3 scale for SDE. IMPACT: Financial loss for across all batches, prominently for 2005,2008 & 2009 batches. If we ignore now we shall lose Rs. 4000-5000 / month of the serving benefits. 3.Stop recruitment of external MT & DGM: Management is neglecting the in-house telecom operations experts and looking for external candidates with same qualifications as we have, with no telecom domain knowledge & place them above us. 4. At par facilities with other associations: We demand at par facilities, as that with other Associations, so that we have a better leverage in achieving our demands. IMPACT: Management is ignoring points/objections raised by us in name of recognition & in some SSAs not giving appointments. 5. EPF anomalies settlement: Since our inception from 2001 EPF is one area where every sect of BSNL viz. management,administration,accounts, etc have condoned upon leading to severe unrest & insecurity among DR community. We are demanding settlement of this issue by setting up a CPF. IMPACT: No control on our hard earned money, which is rightfully ours. 6. Cancellation of Circle displacement on SDE promotion: We are denied the joy of getting promotion after 11 long years and performing well in LDCE. Let us all join hands in ensuring that maximum officers are retained in AP. 7.Uniformity in Time bound promotions: The EPP envisages 1st TBP after 6 years for DRs & 4 years for Dept executives. We demand for removal of this disparity. IMPACT:Financial 2005,2008 & 2009 batch executives to a tune of Rs.2000/month. THINK... WE NOW LEAVE IT TO YOUR DISCRETION AS EVERYONE IS A LEADER..ACT LIKE ONE. DS Sri Ramanjaneyulu along with Sri B.Laxman CWC member, Sri. Krishna Kishore ACS-C1, Sri. Ramesh DFS-HYD, Sri. Mahesh DVP-C1, Sri. Krishna Mohan ADS-C1, Sri Ramu AFS-C1 and Sri. B Shanker addresses the gathering at CTO, Secunderabad and appraised the issues in detail. About 50 members from Cellone TBN, CTO, Saroornagar, Erragadda & Musheerabad have participated. Later memorandums were submitted to Sr.GMs Cellone Sri.Govindarajulu & Sri. GP Reddy. Point wise details were explained to them and we sought their support in quick resolution of the issues. Later they met GM North Sri Satyanandam and submitted a memorandum. DS Sri. Ramanjaneyulu along with CWC member Sri Laxman & DFS Sri Ramesh & Ramakrishna attended meeting at RTTC & CTO secunderabad. The members apprehensions were clarified and a memorandum will be submitted to GM RTTC & GM Cellone tomorrow. 1) All DR's who hav'nt applied leave are requested to apply immediately. Do not worry about getting leave sanctioned. The executives waiting for SDE postings in HTD may submit SR1 to AGM Admn HTD. 2) All ADS/DVP/BS are requested to verify and ensure 100% participation in their areas. 3) Come What May! Keep off from offices. Day-1 programme of the agitation was a grand success. More than 80% of the DR community have voluntarily participated in the agitation by applying leave. Around 80 executives have gathered at Telephone Bhawan & BSNL Bhawan and prayed to GOD for ushering SADHBHUDDI to BSNL management. HTD DS Sri.Ramanajaneyulu, DP Sri Madhava Rao, DP ITPC Sri Venkataiah have addressed the members and appraised in detail about our rights and appealed to one and all to follow CHQ call religiously. Memorandums were submitted to GM -HR HTD, DGM Admn HTD, DGM ITPC & DGM STP. Emergency DEC meeting of HYD was held on 17-7-13 at BSNL Bhawan. It was unanimously decided to participate in the agitation as it is intended to address all the long pending issues of DR fraternity. In this regard every DR is requested to apply leave from 22-7-13 for 10 days in HRMS before 18.07.13 evening as statistics are being gathered at CHQ. Be prepared to participate in mass demonstration at Corporate Office ,New delhi from 29.07.13 on wards. LDCE Qualified SDE(T) willing to join in CTD as per LDCE promotion order are requested to contact. They are also requested to send their Bio data(work experience) to csaigetoactd@gmail.com immediately. We are one more step closer to our goal for privileges at par with other associations. We are proud to inform that the management has given us permission to hold our meetings in the Asman Mahal Auditorium, a privilege granted at par with other associations. We are thankful to our CHQ leadership who have achieved the right of immunity to the Circle Office bearers. Our CFS Sri.Ramu got retention. Click here for orders. The culmination of tremendous efforts made by the Circle & District body has resulted in much awaited posting modification orders. Friends we are only half way through and our fight will continue till the last request is considered positively by the management. It is resounding achievement in the journey made so far by the association and particularly the way our AP leaders have traversed the barriers at the Corporate Office in successfully negotiating with the management. We have embarked into an era of self-reliance and our AP leadership has transcended into decision makers at the national level. Friends please do remember that we are the only association who have fought regarding this issue with complete sincerity and it is only the faith of members in the association that drives the leaders towards the goals. We thank & congratulate our CS Sri.Veerabhadrarao, CP Sri Karunakar, CVP Sri G.Satish, DS Sri. Ramanjaneyulu, CWC member Sri Laxman, CWS Sri Megha Syam for their relentless & self less efforts, each one of whom on an average, were in receipt of atleast 100 calls/day and were all eager not to miss a single case/request. We request our members to have confidence in the Association and un conditionally support in us to achieve more, and thank them for their patience and belief. 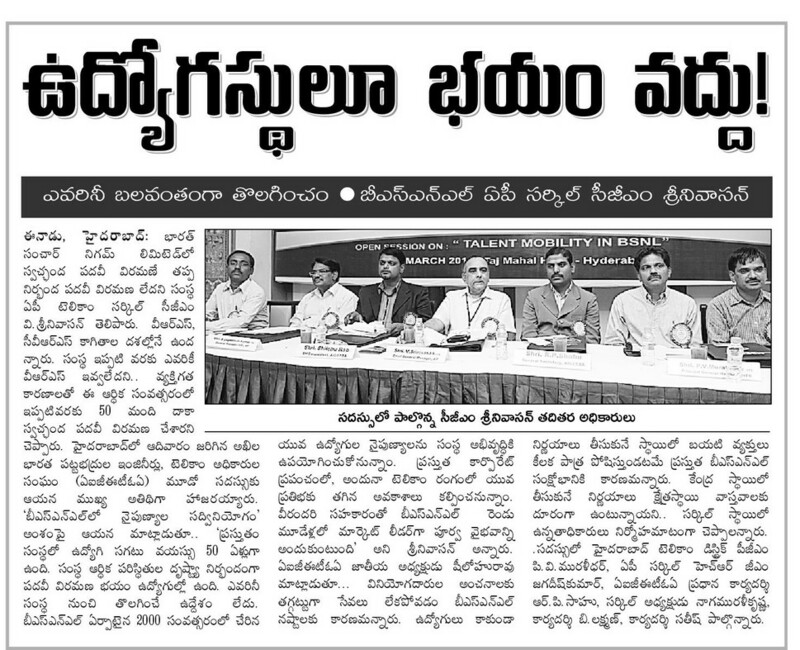 The AIGETOA HTD chapter DEC meeting was conducted on 12-07-13 at Saifabad under the chairmanship of Sri.Madhava Rao, DP. Sri. Madhava Rao, welcomed all the office bearers and invited DS Sri.Ramanjaneyulu, CS Sri. Veerabhadrarao & CFS Sri. Ramu to the dias and explained the developments regarding LDCE postings and the pains & efforts taken by the HTD office bearers in getting the circle office endorsement on war foot basis in view of prevailing court cases. In his inaugural speech DS Sri Ramanjaneyulu appraised the members regarding the latest developments, LDCE postings,etc and the efforts put in the Association for retension.He emphasised that it is only because of efforts of association that spouse cases, lady officers, PH officers modification orders were issued & retention orders of 30% of pending cases are expected today. He also appealed to the members that any pending spouse/PH/Rule-8 with less than 3 years of stay in AP may brought to the notice of HTD body with proper documents ( preferably scanned in PDF format) & mailed to DS. Later CS Sri Veerabhadrarao explained the developments in CHQ & the retention cases progress,etc and informed that the association will be in continuous pursuation with management till all the requests are considered. 1) A nominated team should be sent to delhi to pursue the pending retention cases at Corporate Office & work in collaboration with CHQ. 2) A dialogue will be initiated with the sister associations in an effort to form joint forum for resolving the pending retention cases of AP. 3) It will be demanded to post all the SDE's in the same SSA irrespective of their stay duration. 4) It will be demanded that the SDE's who will be joining CTD & other circles shall be brought back to AP circle by considering their requests after two years. 06-07-2013: FOR IMMEDIATE ACTION ! All the Successful candidates of SDE(T)LDCE whose posting orders are issued by Circle office may submit the Joining report for SDE(T) immediately to Admin section O/o PGM(T)HTD and submit ACG-61. Relieving orders from their respective unit officers is not mandatory. Click here for ACG-61 in word format. After a series of deliberations & consultations the associations had with the management, we could arrive to a formula for posting orders. All incumbents having less or equal to six years of service are retained and posted in Hyderabad. All spouse cases are considered and the posting to neighbouring SSA like MBNG & SGD are considered for lady Officers. In view of upcoming court cases all are advised to join to their new assignments at the earliest possible time. The cases of dislocation from AP circle is being actively pursued by DS & CVP at Corporate Office and the revised orders are expected by next Wednesday. AIGETOA HTD CHAPTER EXTENDS OUR HEARTIEST THANKS FOR OUR BELOVED CGM Sri V.SRINIVASAN GARU WHO ACCEPTED OUR REQUESTS KINDLY IN SDE(T) POSTINGS AND ORDER TO POST ALMOST ALL THE OFFICERS IN SAME SSA/UNIT. IT ALSO EXTENDS THANKS TO OUR GM(HR) SRI. G.S.MARSHAL GARU ,DGM(HR) SMT ANILA KIRAN GARU and Staff section, Circle office. ALL THE newly posted SDE(T)s ARE ASKED TO WORK EFFICIENTLY FOR THE BSNL AS PROMISED TO OUR CGM. Friends, this is the result of sincere efforts of our CS Sri Veerabhadra Rao, CP Sri Karunakar, CWC Member Sri Laxman & the entire Circle Body who had marathon sessions with circle administration and could successfully negotiate the stay period from 4 years to 6 years. We whole heartedly thank all of them. LDCE-2007 Postings issue,Memorandum submission to Circle Administration. District President,M.Madhava Rao along with Circle Secretary,Circle Finance Secretary and other circle office bearers met CGM,GM(HRD) and Apprised the maximum qualified executives from AP circle alloted to different circles and expressed all the executives considering the promotion is not a boon either encouraging. CGM,GM(HRD) assured to take up the issue with Corporate Office for retaining the maximum qualified executives in AP circle. click here for the format. The management seems to be in a habit of constantly hitting on the morale of the DR community and have made a time of jubilance into a mode of introspection for joining this company. We are deeply disturbed the way circles were allotted in the posting orders. The Dist office bearers are in touch with Circle Administration & CHQ and shall see that these posting orders are modified. The individual representation copy seeking modification of posting may pl be mailed ramanjaneyuludv@bsnl.co.in with a copy to CS. We are deeply saddened by the recent developments in the CHQ and we are in constant touch with the CHQ to settle the amicably. The DS & CVP who are in Delhi are constantly monitoring the situation. Hence it is appealed to all the members to keep faith in the Association as it is a conglomerate of ideologies and not persons that brought us together & we shall all fight together to achieve the common goals. Draft report of the Committee regarding introduction of CPSU Cadre hierarchy Vis-a-vis present set up in BSNL. Comments/feedback are required on the report by 10th July,2013. All the Branch Secretaries are requested to give their feedback / comments before 07th July,2013 so that the same will be provided by 10th July,2013 to BSNL Management. AIGETOA HTD Chapter Greets Com. G.L. Jogi, President, SNEA(I) veteran leader on his retirement on superannuation today. We wish him a healthy, Prosperous and happy retired life. It is alarming to learn that DOT has issued orders to retain the land & buildings assets which are to be transferred to BSNL as per the MOU formed in 2000. It is a blot to the already bleeding company and shows the biased attitude of DOT bureaucracy, which on one hand is forcing BSNL to operate in non-profit making sectors and on the other hand denying to compensate through USO funds. We are thankful to CMD BSNL who addressed a letter to Secretary DOT to revise the orders and settle the matter at the earliest. Forum of BSNL Unions/Associations unanimously decided to donate one day pay to PRIME MINISTER RELIEF FUND towards Uttarakand flood victims relief. It is reliably learnt that VC's from AP circle have been sent to Corporate Office today. We sincerely thank the DGM (Admin) HTD and the HTD Admin Section for expediting the process. Memorandum submitted to the DoT, Secretary on visit to MP circle . AIGETOA extends its full MORAL support to the proposed Day-Long Dharna Programme called by the Forum of BSNL Unions/Associations. All members are requested to show thier solidarity with fellow officers/staffs & express dissent towards evil designs of Top Management against BSNL Officers & Staffs. AIGETOA CHQ has already clarified that AIGETOA has not signed the agitation programme notice due to non-inclusion of our request for inclusion of E2 Scale to JTOs and 30% superannuation benefit to DR JTOs/JAOs/TTAs in the demand charter. Therefore, although AIGETOA fully supports the demands raised, we are only morally supporting the agitation program called by the forum of BSNL Unions/Associations. 30/5/2013: HTD ideal Team (HiT) to be launched wef 1-6-13. A new performance evaluation mechanism HiT (Hyderabad ideal Team) is being introduced in HTD wef 1-6-13. As per the new scheme performance of JTO's working in external plant will be evaluated on a monthly basis vis-a-vis with other JTO (Extl) performance based on few designated parameters viz. Demand Generation,QoS,Customer retention,etc. While we completely support the need for increased accountability in the organisation, we also feel the need for uniformity in assessing the performance - across all verticles & cadres. We fail to understand as why it is being implemented targeting JTO 's working only in external plant ,who are already confronting with several challenges. Their performance cannot be gauged independently, as the most of the parameters are dependent on several other processes . It is very unfortunate that the management did not take stakeholders opinion before implementing the scheme. We have several reservations & apprehensions and would like to have a dialogue with the management. All the members are requested to submit their inputs in this matter. The suggestions may be mailed to ramanjaneyuludv@bsnl.co.in before 1-6-2013. It is reliably learnt that the committee constituted for examining the issue of extending Superannuation benefit to Directly recruited employees of BSNL has submitted its report on a positive note. "In our considered view, still there are discrepancies and, therefore, still there is scope for improvement. According to the Expert Committee, for some questions, 2 options can be taken as correct, for some other questions all options are wrong and for few other questions, one option is alone correct. But according to paper setters for some questions (3) three options are correct and for some other questions (2) two options are correct. In such circumstance, we shall look forward to the principles laid down by Apex Court which say that merit shall not be allowed to be the casualty of wrong answer key and the correct answers shall not be sacrificed. Further, in such circumstances, as far as possible, the final authority to decide whether a answer is correct or wrong shall be left to the Expert(s). For some questions, however, if the decision of the Expert(s) does not solve all the problem, we are bound to take appropriate decisions. Therefore, there is nothing wrong in accepting the recommendation of the Expert Committee to award one full mark to all the answers where all options are wrong. Again, for a set of questions when the Expert Committee says option D is the only correct answer and for another set of questions when it says, option A alone is the correct answer, the Respondent-BSNL shall go with the said recommendations and not to substitute them with its own compromise formula of awarding full one mark to all who have opted for A, B and D or A and D respectively. Conversely, the recommendation of the Expert Committee that two options for another set of questions also cannot be accepted as it would create further confusion, particularly when there is negative marking. Therefore, all such questions shall be totally ignored. 20. We, therefore, dispose of all these OAs with the direction to the Respondent-BSNL to re-evaluate all the answer sheets of all the candidates based on the aforesaid principles and parameters and prepare a fresh list of qualified candidates. Since the examination was held on 04.03.2012 and candidates are awaiting for their promotion for over an year, the Respondent-BSNL shall ensure that the fresh list of qualified candidates is published as early as possible, preferably within 2 months from the date of receipt of a copy of this order. " 1. LDCE not cancelled and there was consensus for the same among all. 2. Expert Committee earlier recommended 12 corrections, out of which BSNL followed 9 in toto and in case of 3 questions (Set A - Q.No. 21, 32 & 59) where there were conflict among expert committee & question-setter, BSNL while preparing final answer key had chosen the comprise formula which was a mistake as per the above judgement. 3. Re-evaluation of answer sheets & release of fresh list of qualified candidates are to be done prefreably in two months. 4. While re-evaluation, Expert Committee recommendations are to be strictly adhered where there are clear single option mentioned. However, questions where there are two options recommended by expert committee, such questions shall be totally ignored. argument on LDCE case is over from both the side at Humble P-CAT and judgment is reserved with the direction to BSNL to submit the relevant documents regarding expert committee report in finalizing the answer key within 2 days. There are still 56 pending V.C cases in HTD, due to reach PGM Office. All the members whose V.C's have not reached the PGM Office are requested to kindly pursue the same. AS one of the bench member on leave , hearing re- scheduled on 30-4-2013. All the DVPs,ADSs,Branch secretaries kindly ensure VC of the members under your area forwarded to PGM office immediately. Today the hearing for LDCE Court Case was held at Hon'ble P-CAT, New Delhi. The case was argued strongly in our favor by our counsels. The Senior Counsel from BSNL, another Counsel from BSNL Side, Two Counsels from AIGETOA and one counsel from successful candidates appeared for hearing. The counsel from SNEA has also moved an impleadment application. The argument from both the side was heard in the court though the opposition side wanted a long adjournment, the Hon'ble PCAT has posted the case for final argument on Tuesday, the 23rd April 2013 at 2.30pm with a firm direction that case will be heard and on that day itself irrespective of whether any body is present or not. We are expecting a firm outcome on Tuesday. Submission of Vigilance cleareance . DGM(Admin) clarified that in the new 14 point proforma . Coloumns 1 to 9 will be filled by the SDE(A) as per service book. kindly pursue with respective SDE(Admin) to be dully filled and to reach PGM-office positively. Posting of Staff to strengthen the transmission and Marketing wings. AIGETOA-HTD addressed DGM(A) to strength the Transmission section for manning the main stations on 24*7 with suitable staff. Additional staff in the Project Vijay for covering Ruarl pockets especially. DGM(A) positively responded to look the issues. In view of the poor response of members from LDCE Qualified and others, the protest through one day mass C.L on 08th April, 2013 has been called off. Out of 3300 LDCE Qualified candidates only 685 have applied for C.L, where highest was from A.P (285) and rest of the circles an average of 40. Sh. Narendra Kumar, CWC member who graced the meeting with their presence. Sh. Veerabhadra Rao CS AIGETOA AP Circle has appraised the members about the deliberations of the 1 st CEC meeting of AP circle and explained in detail the discussions they had with the management in regard to the improvement of network QoS of Cellone , HR policy matters like transfer policy and assured the members that AP circle management is very positively considering the inputs provided by the Association and sought feedback from the Dist body of HTD for betterment of the prospects of DR community. Sh. Ramajaneyulu started the meeting and sought the members opinion on the agenda points notified for the meeting. 1. Mass CL on 8-4-13 in protest of indifferent attitude of the management towards the career prospects of DRs. Deliberations: DS in his inaugural speech explained in detail the attitude of the management to completely jeopardize the career prospects of the DR ‘s by adopting the partisan techniques which are leading to litigations and has appealed to all the DEC members to disseminate the CHQ call of expressing the protest by applying for mass CL on 8-4-13 among the members. He appraised that the CL may immediately be applied through HRMS only and get it sanctioned by the controlling officer. In case of any issues with regard to sanction of CL it may be brought to the notice of the DEC members. The reports of the leave will be directly monitored at the CHQ level. HTD members have been in the forefront of all the struggles and let us embark on the second call given by the CHQ “Death Before Dishonour” by expressing our solidarity and support in complete unison. It was unanimously resolved to inform all the DR members irrespective of recruitment batch, qualified/disqualified in LDCE the loss being imparted upon us both financially & functionally by delaying the LDCE postings. Had the LDCE process completed without any hitch, next LDCE could have been conducted in 2012 itself for which all DR’s upto 2007 batch would become eligible. The total process was impeded and the morale of the entire DR community is badly impacted. Only due to the poor HR policies of not putting the right person for the right job is impacting the already ailing BSNL. The panacea is only Struggle against the injustice and by one and all. 2. Formations of Branches and ensuring monthly subscription collection to strengthen the Association. It was unanimously resolved to form 14 branches in HTD and delegate the powers of collecting the monthly subscription, from the designated members of that particular branch, to the branch secretary. The receipt books shall be made available shortly and the body appealed to all the members to strengthen the Association by clearing the subscriptions promptly. Total 14 branches were formed. CS & DS spoke to JS-South and enquired about the on-going court cases and apprised the members that the LDCE case is closely monitored by the CHQ and the solution to the present imbroglio is close to a final positive outcome. DS also informed the members the seniority case filed by the DR fraternity of Jabalpur which resulted in positive outcome and nearly 2000 members will be benefited from the judgement. CS & DS informed the proceeding of the Roster case filed at Chennai. The Dist body provided few inputs to the circle body regarding the judicial cases and CS assured the members that the points will be taken up with CHQ in the pre-AIC. 4. Accomodation for the AIGETOA-HTD. It was unanimously resolved to demand accommodation from the management for holding meetings and other Association proceedings. The DEC meeting was concluded with a vote of thanks proposed by Shri. Krupanandam. It is proposed to hold a Dist.Executive Body meeting on 4/4/2013 at Asmanmahal to discuss the program of Mass C/L on 8/4/13 as per CHQ instructions to show solidarity regarding LDCE issues. Meeting with PGM-HTD,Introduction of newly elected representatives of AIGETOA-AP&HTD, Broad band service improvement measures. Circle-president-Karunakar, CircleSecretary-Veerabadhrarao,CircleVPG.satish ,District president Madhavarao,Districtsecretary-Ramanjaneyula,OrganisingSecretaryNarender,Pavan Subbardeddy met PGM and introduced the newly elected Circle body . PGM greeted the Circle and HTD members. PGM assured for early transfer of JTOs/SDEs who have completed 3-4 years of service in HTD-Rural . AIGETOA-HTD provide the feedback on improvemet of Broad band service issues. PGM welcomed the suggestions and expressed openess to welcome the suggestions from the association. It is to bring to the kind notice of the members who have not yet submitted their AIPR please submit immediately to AGM Vigilance for the vigilance clearance of LDCE. Our experiences at the Circle Conference and HTD District Conferences. So, finally the fatigue has worn off, the excitement has calmed down and it’s been around 10 days that the circle conference at Hyderabad which was termed a grand success is over and we are still basking under its success and feeling proud when some one says that the conference was conducted well. It was not a one day or one man’s effort that has resulted in this, but was rather a combined effort of many people who have actively participated voluntarily, working relentlessly for many man hours to achieve the desired results. In this regard I should mention two names in particular, Sri .G. Veerabhadra Rao District President and Sri. G.Satish, District Secretary of Hyderabad Telecom District who above all have done their best in bringing out the best out of the team and had been continuously in touch with every member, helping him in performing his job meticulously. It all started with the decision to hold Hyderabad District Conference in the month of Feb 2013, for which we wanted to invite Sri.N.J.P. Shilohu Rao, Honorable Circle President and Sri. R.P.Shahu, General Secretary as chief guests, but their un-availability on requested dates along with their suggestion to conduct Circle Conference before CHQ Conference resulted in holding District Conference along with the Circle conference on 3rd March 2013 at Hyderabad. We were presented with a tough task of conducting the Conference in very short duration of 10days and with a very limited budget, teams were made for which members came forward voluntarily to take up the following tasks. Veerabhadra Rao (Veeru) was responsible for finalizing the mementoes, transporting them and correlating with the media (press) for an effective coverage. Subba Reddy, P.Ramesh were required to book the IQ’s and Hotel rooms for the guests and visitors for their stay and fresh up. They were the receiving party taking care of guests. Venkata Raghava was supposed to bombard the members with SMSes which would eventually force them to attend the meeting, which I would say was done exceptionally well, where I even remember our members saying that they have received up to 27 messages in last 3 days. He was also a member of reception committee along with P.Ramu at the conference. Ramu being the District Finance Secretary had to shell out a lot of money and at the same time keep track of the money flow, which was his forte. Satish, M.R.Narender, Krupanand were made responsible for booking of Hotels, Transportation and it took them around 5 days of pursuing to finalize a hotel which could meet all the requirements of the conference. They were also instrumental for the banner, poster printing, distribution, flowers and snacks. And I have to say that Satish was involved with almost every thing, giving his suggestions on all matters. Smt.A.Kavitha readily accepted the job of anchoring the entire event and had performed excellently with ease and grace is hosting the show to her level best. I made the poster, invitations and other banners, where my work was to design them and Satish connected to me via his mobile and Team Viewer. He would make suggestions and corrections helping me to implement his thoughts into the picture, whether it was the poster, the banner or any thing else. We would end up sitting till 10.00 P.M in our respective offices, located remotely from each other, but still connected by phone and I would say it was fun. Krupanand was on his camcorder recording and me photographing the conference. D.V.Ramanjanelylu was to select the gifts, file folders, chairs and other accessories from tent house, printing of the invitations and distributing them. At the end of the day, on the night before the D-Day, we were there, all of us at the hotel seeing our efforts come to a shape and felt satisfied that we have done our best and the results were to be seen at the conference. On this occasion, on behalf of AIGETOA – Hyderabad Telecom District I would like to thank every one who has put his best efforts to make this Conferences successful and memorable to all of us. Ex-Web Secretary , AIGETOA HTD. Circle-Vice President, Shri.G.Satish,Distict President- M.Madhav Rao,District Secretary -D.V. Ramanjaneyulu, Finance Secretary Ramesh met DGM(admin). Circle president introduced the newly elected HTD district body and discussed the pending rural transfers .DGM(admin), assured Rural request transfers will be considered as soon as the incumbent from other SSAs joined. DGM admin extended Warm Wishes and BEST OF LUCK to the newly elected body. Click here for the newly elected body office beares. As per the resolutions taken in the Circle Conference held on 03.03.2012, a Special Circle Executive Committee (CEC) meeting is called for, to be held at Hyderabad on 24th March, 2013 to fill in the remaining posts of circle body through elections as per the instructions of CHQ. Hence all the DS/DP along with the aspiring candidates are instructed to be present at the CEC without fail. The entire circle body could not be elected on 03.03.2013, due to the delay involved and security measures taken up by the hotel management in view of the bomb blasts in hyderabad. Sri. P.Ramu : elected Circle Finance Secretary. Under the chairmanship of joint secretary south, Sri.Satyavardhan Rao. The venue and time will be informed at the earliest. "As per DOT order no. A-11013/64/2012-Abs. Cell (I), dated 11th March, 2013 and BSNL Corporate office letter no. 400-45 / 2013-Pers. I dated 11.03. 2013 all ITS Officers presently working on deemed deputation in BSNL who have not opted for absorption in BSNL are relieved and repatriated to DOT with effect from 11-03-13". "As per DOT order no. A-11013/64/2012-Abs. 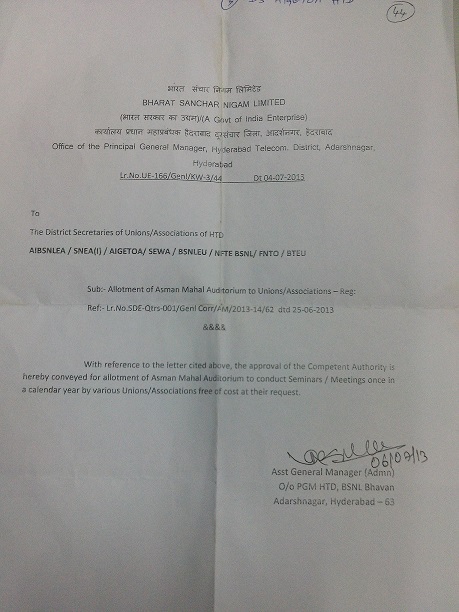 Cell (II-A), dated 11th March, 2013 and BSNL Corporate office letter no. 400-45 / 2013-Pers. I (2) dated 11.03.2013 the ITS officers repatriated from BSNL to DoT through the above said repatriation order dated 11.03.2013 are deployed in BSNL w.e.f. 11-03-2013 A/N as per terms and conditions of deployment of ITS officers in BSNL". "All the ITS officers repatriated to the Department of Telecommunications will be deemed to have joined DoT on repatriation before their deployment in BSNL. As such, these ITS officers are not required to physically report to the Department of Telecommunications on their repatriation". It is learnt that the Management Committee has approved the "Child Care Leave in BSNL" in the meeting held on 7th March 2013. This is the biggest gift that BSNL could have given to its women employees on "International women's Day". AIGETOA has always been fighting for Implementation of "Child Care Leave" in BSNL and has pursued this issue at all platforms be it MOC, be it DOT, be it BSNL Management. The issue was also taken at different forums by AIGETOA like United Forums of BSNL Executive Associations & united forum & JAC. Child Care Leave is a leave that can be granted to women employees having minor children below the age of 18 years, for a maximum period of 2 years (i.e. 730 days) during their entire service, for taking care of up to two children whether for rearing or to look after any of their needs like examination, sickness etc. Child Care Leave shall not be admissible if the child is eighteen years of age or older. During the period of such leave, the women employees shall be paid leave salary equal to the pay drawn immediately before proceeding on leave.It may be combined with leave of the kind due and admissible. There was a condition envisaged in the Office Memorandum relavant to Child Care Leave to the effect that CCL can be availed only if the employee concerned has no Earned Leave at her credit. However, this condition was withdrawn by the Government , hence CCL can be availed even if EL balance is there. Conditions regarding spell of CCL, imposed upon by the Government are that it may not be granted in more than 3 spells in a calendar year and that CCL may not be granted for less than 15 days. As in the case of Earned Leave, we can prefix or suffix Saturdays, Sundays, and Gazetted holidays with the Child Care Leave. Under no circumstances can any employee proceed on CCL without prior approval of the Leave sanctioning authority. The third Circle Conference of AIGETOA - Andhra Pradesh Circle, which was conducted with much pomp and pride on 3rd March,2013 at Taj Mahal Hotel, Abids Hyderabad has been a grand success. The presence of our Chief guest Sri V.Srinivasan CGMT A.P.Circle, guest of Honour Sri P.V.Muralidhar PGM HTD and Sri B.Jagdeesh Kumar GM(HR), AP Circle, dignitaries from CHQ Sri N.J.P.Shilohu Rao , CHQ-President AIGETOA , & Sri R.P.Shahu ,General Secretary - AIGETOA , leaders from other unions and participation of around Three Hundred members of AIGETOA A.P Circle have made the Circle Conference a grand success. The event was inaugurated by the chief guest lighting the ceremonial lamp in midst of full house of members from HTD and delegates from other SSA's. An open session on "Talent Mobility in BSNL" was conducted where the guests expressed their views on the topic. CHQ President Sri.Shilohu Rao presented a power point on contemporary talent management practices in various successful organizations and elegantly narrowed on where BSNL is lagging and how the in-house talents are being neglected by the HR policies of BSNL. PGM- HTD Sri. P.V. Muralidhar acknowledged the contribution of DR's to BSNL and advised that the talented lot should extend helping hand to the non performers in current scenario in the interest of BSNL. GS Sri.Shahu apprised the management perspective on the talent mobility and pointed out to the lacunas in framing the recruitment rules. Chief Guest Sri.V.Srinivasan expressed the constraints of BSNL which being a government undertaking is bound to carry the weight of non performers and the decisions of management is being influenced by the people who are not the stake holders of BSNL. He expressed that he is hopeful regarding the prospects of BSNL and requested everyone to introspect his / her contribution to BSNL. Every one in unison has agreed that Talent Mobility is need of the hour in BSNL They emphasized on grooming the talent with in the organization rather than to bring outside talent for the betterment of BSNL. The event was later followed by presentation of AIGETOA Excellence Awards for outstanding contribution to BSNL and AIGETOA. Sri. Sukumar , JTO Nellore SSA. The Fourth District conference of Hyderabad Telecom District commenced with the presentation of District Secretary Report on various achievements by the HTD Team, followed by felicitation of the outgoing District Body. A new District body was elected unanimously in the presence of CHQ President and General Secretary. Sri.P.Ramu,HTD was elected as Circle Finance Secretary unanimously. Its proposed to hold a candle light march on 25th Feb, 2013 i.e. Monday by the BSNL fraternity to condemn the recent blasts in Hyderabad. The rally will start from BSNL Bhavan at 06.00 PM . Further details will be updated soon. Conference posters have been dispatched to Adilabad, Ananthapur, Kadapa,Guntur, Karimnagar,Khammam,Kurnool,Nellore,Rajamundry,Sangareddy,Vishakapatnam,Ongole, Nalgonda & Tirupathy SSA'sby Speedpost to the respective District Secreteries. The Posters were given by hand to the remaining DS's on 10/2/2013 in the CEC meeting. It is requested to paste them in important locations/GM offices/Tax blgs etc. to have wide publicity among our members. AIGETOA AP level Cricket Tournament is going to be held on 24 Feb, 2013 (Sunday) in Hyderabad. Interested participants may register themselves "here". The Preparations for the 3rd Circle conference/4th HTD district conference have begun with the mega event just 18 days to go.. The first major contribution has come from Mr. Megha shyam (JTO-BB, lingampally),Web secretary of HTD, who had designed the conference poster within a short notice of 2 days. Hatsoff to his creativity, dedication & commitment. ** On invitation from circle office, DS-HTD along with CS attended the launching function of Voice & Video over broadband in the conference hall, O/o CGMT - AP. The Circle Exec. Body meeting of AP Circle was held in Asman Mahal Quarters on 10/2/13. The meeting was attended by CS,Joint secretary (South) along with representatives from Hyderabad/Warangal/Vijayawada/Mahboobnagar/Nizamabad/cellone/STP & ITPC. It was unanimously decided that Hyderabad will host the event. The official poster was launched by JS(South) Sri. Satyavardhan Rao. Elaborate discussions were held on joint conduction of Circle/HTD district conference/LDCE/DGM case/ Probable circle body for the next term/financial status of the circle wing and of course on holding a cricket event before the conference etc. The organizing team for the grand event will be finalized shortly. AIGETOA -HTD is thankfull to Mr.Ramesh, JTO-Central for organizing the event at a very short notice. DS & CS met CGMT-AP in his chamber and requested to allot his time to attend the Circle conference/District Conference-HTD. CGMT accepted the request and it is decided to conduct the 3rd Circle Conference/ 4th HTD District Conference on 3rd March-2013. The same was conveyed to Gen.Secretary/All india president. It was decided by CS that a circle level CEC will be conducted on 10th Feb'13 in hyderabad to decide the mode of conducting the Conference. Venue and further information will be intimated shortly. Diaries have been received by admin.sections of all the wings in Hyderabad i.e NORTH/SOUTH/CENTRAL&WEST/MAIN/CELLONE/CO/RTTC. Members are requested to collect the same. DS, DP & Narender Kumar (Exec. 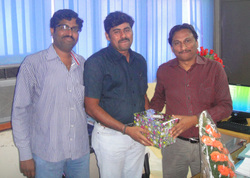 Body Member) met DGM -Admin Shri. Raja Rammohan on his relieving to Assam Circle on 16/01/13. AIGETOA-HTD presented him a memento & wished him best of luck on his new posting. The Executive Body Meeting of AIGETOA-HTD was held in Patny Telephone Exchange building on 9/1/13 in a grand manner. The meeting was attended by all the executive body members from HTD, Cellone & circle offfice. One day special C/L was granted to 30 body members (HTD-25,Cellone-2, CIRCLE OFFICE- 2 & RTTC-1). The meeting was presided by CS, ACS and CWC membes from Hyderabad. 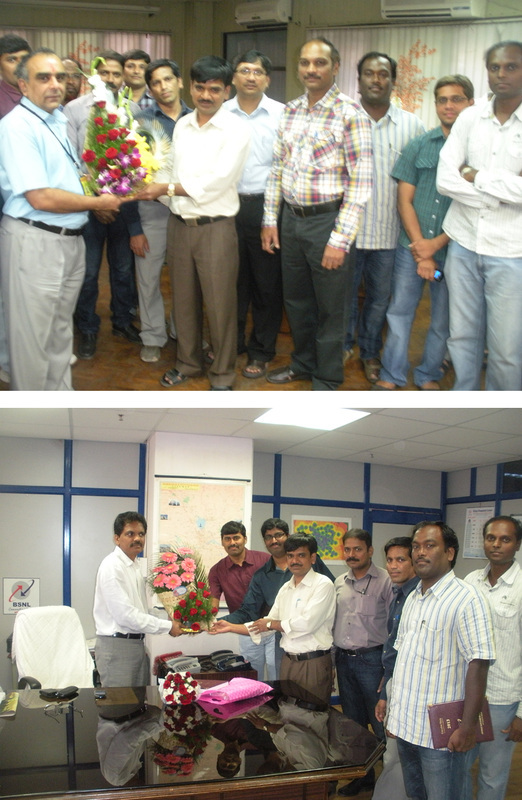 On the occasion of completing 2 years of the HTD-Body, DS,DP,FS & OS were felicitated with mementos. It was unanimously resolved that the next district conference will be conducted on 24th of February-2013. The resolutions of the meeting will be uploaded soon. AIGETOA-HTD is thankful to shri Ramakrishna(BS-North) & shri Ramanjaneyulu( DVP) for successfully organizing the event. C.S Sri B.Lakshman and other Executive Body members met CGM A.P Circle and PGM HTD to greet them on the occasion of New Year. 2. No Pay cut for the strike period. 3. One representative before mgmt is equivalent to 10000 members behind him. 5. We came to know about members who can really stand behind us and who are opportunists. 6. We have now emerged as true leaders among the entire BSNL executives. Reality: Apply EL on MC if leave not sanctioned, and dont worry about the sanctioning formalities. Just keep off from office & work. Reality: You are terribly delaying the dialog process as the mgmt feels every thing is smooth so why why call for discussions. Let the mgmt feel the impact of your absence. Pl refrain from such practises. Reality: Association will relentlessly fight for people who honours its call. If members do not respond when association needs it the most, they are on their own. No support from association will be extended to such members. 5. MYTH: I m a member of other Association. Hence I ll not participate. Reality: Take pride in fighting for our rights. It has nothing to do with the membership. Support the movement if you feel the demands are genuine & will benefit all DRs. Reality: We made it an agenda point & we are sure of getting the displacement cancelled.It is appealed to participate whole heartedly. Re-Introduction of Shifting and name transfer charges in CFA segmnet. Use of CAT-5 cable inplace of Drop wire for Broadband provisioning.